The first release of WPBakery Page Builder during summer season comes up with the new features and options that will help you come up with award winning layout designs that sell in minutes. WPBakery Page Builder 4.6 offers well crafted, feature rich content elements and site block styling options according to latest trends and practices. Completely new elements available out of the box along with improved well known content blocks once again bring tremendous capabilities for any type of WordPress users. With Parallax background already available out of the box the next obvious step was introduction of full height row option allowing easily divide your WordPress site into logic structure and focus customer attention. Such behaviour makes full height row very demanding feature for Landing Pages and sites where business is seeking to grab user attention without giving any chance. Another smart way of using full height row allows spreading small pieces of content across site in order to either have a minimalistic design or solve the problem when there is not enough content for you to choose from. 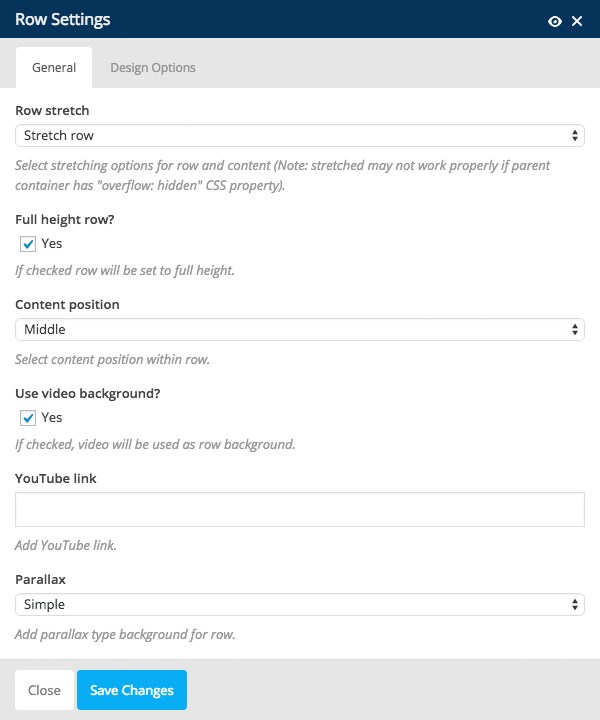 WPBakery Page Builder has a new fancy option that will surely make your WordPress site look trendy – ability to add YouTube video to row background. Taking into account high demand and many feature requests there is an easy to use control for adding YouTube video to any row background by simply copy/paste link to any YouTube video. Even better news is that you can combine this option with Parallax or Full Height options of WPBakery Page Builder. With the higher expectations from our side and continues requests from our customers we came to conclusion that previous jQuery UI based tabs, tours and accordions are no longer able to satisfy the needs of top page builder in both – visual and technical side. Having this in our minds we began to work on a new complex element for complete rebuild of tabs, tours and accordions. The main goals was to offer our customers so necessary styling options backed up with technical features like hash navigation which allows introduction of direct linking. Multiple tabs, tour and accordion styles aligns perfectly with other WPBakery Page Builder content elements to complete any WordPress theme and offers wide range of styling like icons, color schemas and so on. Such options like content part fill, gaps and spacing allows quickly create perfect element for your site. Representation of data as charts can significantly improve UI/UX of your site by offering your customers alternative and visually appealing way of viewing complex data. Properly placed charts can drag attention to the information you want to communicate most and become important part of your site design. With different types and data sets it is often crucial to have different chart types that suits best for this case. WPBakery Page Builder 4.6 offers 4 completely new JS based charts which allows representing data in doughnut, pie, line and bar styles. While you may want to use doughnut and pie charts for simple data – some other cases may require line and bar charts so you can choose from. And the very good news are that you can easily animate any type of charts. Everyone knows how important it is to have a high quality content on your site – having bad quality media on your site can ruin it, while good looking images can boost your potential customers to make a purchase or get in touch with you. We all work on having beautiful images, but not all of us know Photoshop or some other complex image editing tool. Nevertheless we all have seen how easy it is to make an average image into pro looking photo with Instagram. Well, now you can do the same within WPBakery Page Builder by applying carefully chosen filters to any image of your Media Library – just add image, choose filter and see result instantly. With this new feature you will be able to add a good looking media to your WordPress site in no time and amaze your customers. In addition to large and medium size features WPBakery Page Builder got minor enhancements that you will find handy enough to give them a try. Even the size of those features is considered as small it does not mean that they are least important. 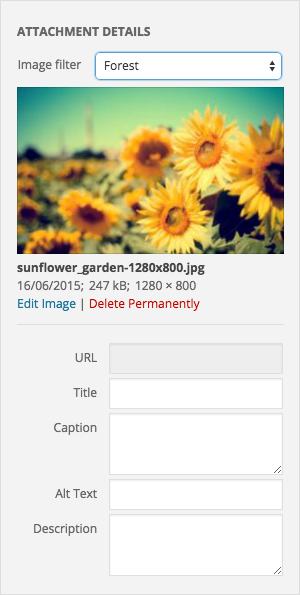 One thing to mention and which was on our radar a while already – all images added to your WordPress site through WPBakery Page Builder has ALT tag displayed in markup. Moving forward with element enhancement – our fresh baked buttons has received another additional style which allows create you custom buttons on the basis of Outline style. Another good thing to mention is ability to use theme defined fonts in Custom Heading element as it is not mandatory to use Google Fonts any more. With this release WPBakery Page Builder is getting even closer to full element update in order to offer unified standards and trendy design concepts to reveals completely new chapter for your number one page builder.